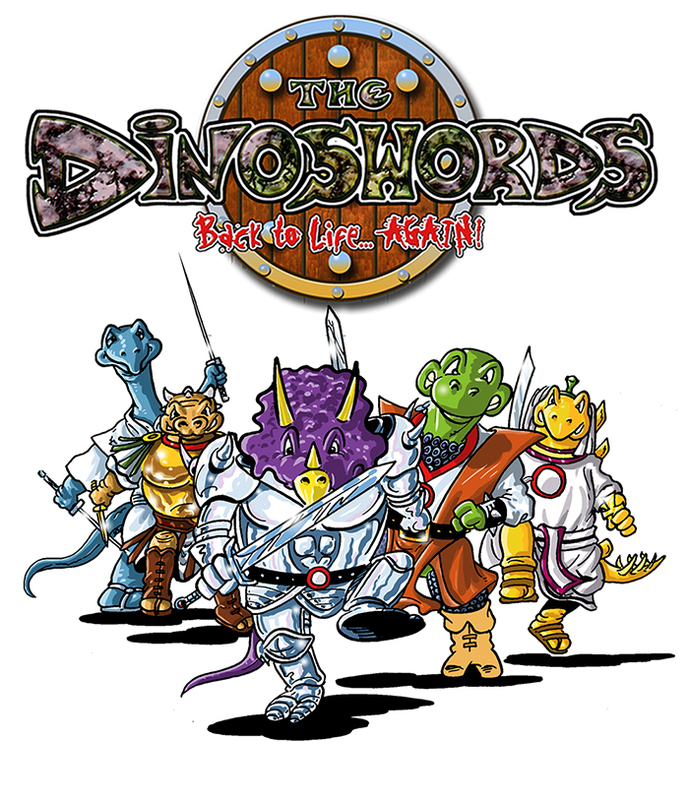 The DINOSWORDS Website is now live - Pre-orders now being taken for the Comic, which will launch at MaltaComicCon 2015 in December. Well NOW we can announce it to the world, as our website is now live at last and will be followed in November with the release of a Brand New Comic Book from Wizards Keep Publishing alongside some merchandising. Well what's it called we hear some of you saying…? The Logo above was the giveaway – YES we are bringing back The DINOSWORDS. Now you can all take a look at our five main heroes; Arnie, Errol, Clint, Brontson, and Sly. If you were a kid in the 1990s or indeed a collector/reader of comics back then, then there is the slightest chance you may recognise these guys from those dim misty days in the past – not quite as far back as the Cretaceous Period from whence our five Dinosaur buddies hail from, but it is a while ago now. Many folks have asked about the characters and something said the time was right for their return to our present day world. The Primordial Edition is a 44pp part colour – part black and white comic magazine with a full colour cover. There are a total of 38 black and white strip pages, which reprint the first 12 episodes and a further six episodes, with never before seen pages, which sort of tie up the storyline or should we say bring us to a juncture which allows us to turn the present stories into a work-in-progress for a finale to this current storyline and the start of a brand new direction for the characters. Created back in the eighties with the help and input of, his fellow conspirator, Writer, Editor-in-Chief, James Hill the five BIG guys found a short stay and temporary home in the pages of Triffik comic and in actual fact where the lead story upon the launch day at BBC Radio 5 studios on the Johnny Walker show. The direction was not quite what they had envisioned and although it was a humorous concept it ended up in a humour comic, which did not quite match up to their original vision. However, they had found a temporary home at least, as we say. Tim and James are really excited about this comic, which comes with NEW cover artwork, some new digital colour, new lettering and word balloons and a newly revised script. It also, as already mentioned, allows everyone to see the entire story as produced back in the day, although still unfinished. We hope you enjoy the website, comic book and all the other merchandise waiting in the wings at the moment, as much as we have in producing them for you all. There is also a Fans Page for FAN ART and letters to the Studio or indeed the Dinoswords themselves on the NEW website. There are BONEus prizes to be won too, so go on check out the website and see what all the fuss is about. The OFFICIAL LAUNCH of The DINOSWORDS Primordial Edition will be at MALTACOMICCON over the weekend of Saturday 5th and Sunday 6th of December in Malta. As always we look forward to hearing from you all with your views. Please watch out for more updates on Worlds End and a NEW COMPETITION Coming your way SOON!! !